Best Friend Fence has been your top choice for dog kennel fencing for over 15 years. We have provided you with a safe and humane way to contain your dog in to the confines of your yard. We have found a way to contain your dog in a designated area without having to use harmful electric shocks or construction material that can harm your dog. Our dog kennel fencing is constructed of a polypropylene composite that isn't only durable but it's also safe. In fact, it's designed to last up to 20 years with minimal maintenance required. It's made to be UV resistant, and also has anti-oxidants to make it strong enough to brave the elements without becoming damaged or rusting. Click here to view our available dog kennel fencing products! 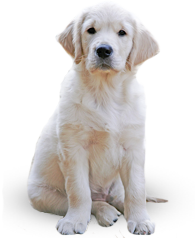 Contact us if you have any questions about our dog fence solutions. Many don't realize that when they construct their dog kennel fencing from chain-link or wooden fences, it can pose a serious health risk to their dogs. Chain link fences can rust, leaving them weekend, and they could also develop sharp edges that could potentially severely injure your dog. Wooden fences eventually start to weaken in the rain, and as the wood starts to rot, pieces could fall off of the fencing, and your dog could accidently ingest a piece of it. Our polypropylene fencing material is strong, and the mesh construction of the fence makes it practically "Chew-Proof". The holes in the fencing makes it possible to watch your dog and are designed to be just small enough, that your dog won't be able to stick their nose through one of them, to get their teeth on the fence. This makes it impossible for your dog to chew their way through to escape or at the very least, chew a piece of the fence off, causing an injury. Best Friend Fence alleviates these possible scenarios by offering you a dog kennel fencing solution that is as harmless as it is functional. It can withstand harsh weather, and still remain protective. Our dog kennel fencing is much safer then tethering your dog in your yard as well. A tether depends on the strength of the mounting spike, which can be pretty unreliable, especially if your dog gets excited, and outruns the designated length of chord provided. This can either cause a neck injury to your dog, as they get jerked back to their specified area or the mounting spike could break free from the ground and your dog can then escape. Either of these situations can have detrimental effects on the safety of your dog. It also depends on a leash or chord that isn't safe for your dog either. While your dog is running around your yard, the chord can accidently wrap around your dog. The leash also drags through your yard and causes damage to your grass. It will leave a perfect circle of dead grass around the circumference of the tether. These types of systems do not benefit you or your dog as much as a dog kennel fencing system from Best Friend Fence. With a dog kennel fencing system for Best Friend Fence, you can be sure that your dog is free to roam their designated territory and you won't have to worry about injury or escape. Another great benefit to having the dog kennel fencing system from Best Friend Fence is that it doesn't take away from the aesthetic value of your yard. The fence is designed to be virtually invisible from over 20 feet away. Your dog will be properly contained, and your backyard won't look like a prison. 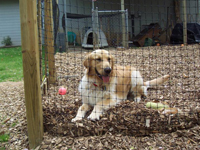 The mesh fencing design offers your dog protection without being visually obstructing. Its dog kennel fencing that will keep your dog safe, and is very low profile. The installation involved with our dog kennel fencing is simple as well. It's designed to be implemented with minimal digging. All you have to do is install the steel posts around the perimeter of the area you want to designate, fasten the mesh fencing to the post with the sturdy zip ties provided, and you're done. It's a simple process that comes with a lot of results, and the best part about it is that you don't have to hire a professional to have it installed. The dog kennel fencing kit comes with everything you need to give your dog the kind of protection it deserves. The dog kennel fencing system from Best Friend Fence is the perfect solution for people who are looking for a great way to contain their dog, but are worried about their dog's safety. It's strength and durability will safeguard your pets from running away, and will safeguard your wallet from having to constantly pay for up keep and replacement for other types of conventional fencing. Best Friend Fence knows how important your dog is too, and that's why we want to offer you the best available option for dog kennel fencing.